I have never been to any karaoke place outside Indonesia, but I heard, karaoke outside Asia means singing in a karaoke pub, in front of strangers. We do it differently; we rent a private room equipped with modern karaoke facilities. The price range from USD 7 – 30, depend on its capacity. As you might be aware, Indonesians tend to go in a big group with friends, family, relatives or colleagues rather than in small group. The more, the merrier and of course, the cheaper it gets. The family I explained above is a family karaoke and Jakarta also offers a non-family karaoke. We call this ‘karaoke plus plus’ which usually more expensive because it involves girl(s). One will get a right to select as many girls as he wants for the sake of pleasure. There are many awful ways of selecting the girls, including by point a girl(s) in the aquarium or the photo (either in the album or on the wall). Another way of selecting is by requesting them to line up in the karaoke room and choose the one that suitable. The price for the girl and the service are negotiable, but it is usually above USD 50. 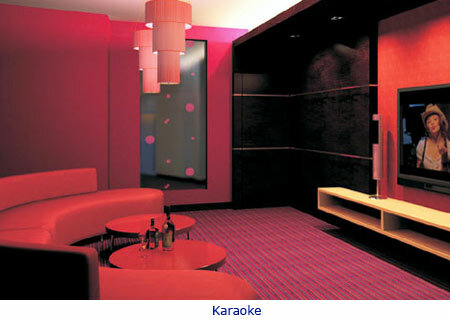 Karaoke plus-plus usually provide shower in the private karaoke room is. What an excercise eh that one should shower after singing? Private karaoke room provides freedom to sing, no matter how terrible the voice is. For many Indonesians, karaoke is place to release stress by screaming singing and having fun with the closed ones. Some Indonesians even go beyond having fun and consider karaoke as a serious exercise for their vocal and for their confidence level. So once they get out from the karaoke room, they think the have wonderful voice and capability to perform anywhere. These overconfidence people will usually grab any opportunity to torture entertain others with their awful voice. I recently attended a wedding where relatives of the newlywed (relatives are easily identified by the same-color dress they wore) took the microphone and sang a sad song that ruins the festivity of a wedding. Ideally, any single sad song should be forbade from a joyful occasion. However, many Indonesians do not care about ruining someone else’s wedding party, all they care about is to perform. Anyway, this person sang confidently with her terrible voice and a very bad English pronunciation. IMHO, it was a disastrous performance, yet no one (including me) stopped this person. I guess our society is so tolerant, or too tolerant. We would be more than happy to see people humiliating itself in public and fulfilling their need to be exist. Wedding singers in this country also love to invite anyone in the wedding party to come to the stage and sing for the newlyweds. My brother did it better, he forbade everyone, including the relatives to sing. He even threatened to cut the band’s fee. Was it effective? I say it was with a little hiccup. One person still managed to go to the stage and stole (literally) the moment by singing Titanic’s famous theme song. For the love of God, my brother is starting his journey and the last thing he wanted, I’m sure, is a sinking ship. Btw, she brought her own keyboardist. To all the brides-and-grooms to be, please stop your relatives and friends from ruining your party. Ensure that your wedding singer(s) wouldn’t invite any stranger to the stage. Forbid them if necessary. Remember, you would want a sweet and memorable wedding. If you foresee that your relatives will still hijack the stage then hire a violinist who can only play classical music. Until then, please refrain yourself from hurting someone else’s ears. Disclaimer: Not all Indonesians like karaoke and behave like the description mention above.